379v3. A multi functional New build Race transporter in 2014 to carry 4 formula cars or 2 GT cars, when setup at the circuit the transporter will have a management office, driver room, engineers room and workshop. Trailer: 2014 Bespoke double deck. Deck heights: Top deck 1450mm, Lower deck 1930mm height. Awning: 13m x 8m Awning Co, white PVC sides, white sail cloth roof. Generator: Kohler marine 9kw 230volt single phase. 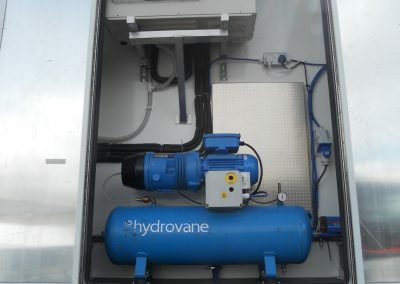 Compressor: Hydrovane 230 or 415v depending on spec. Doors: 1x HMS side doors on the goose neck with 1x internal step into the management office. mounted steps, fitted with coach style handle. locate on the side of the truck without the platform. rail for the slide out platform that will flat pack for travelling. 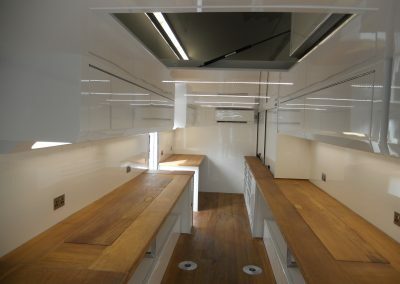 Neck Lockers: 1x locker on the goose neck of the trailer, length 1450 x 500, coach style up & over door. Doors: 1x HMS side doors after the goose neck with 1x internal step into the driver’s room. Doors: 1x HMS side door with 1x internal step into the workshop. Internally the roof will be finished in stucco aluminium, the roof panels will be bolted in for access to various power and air cables. 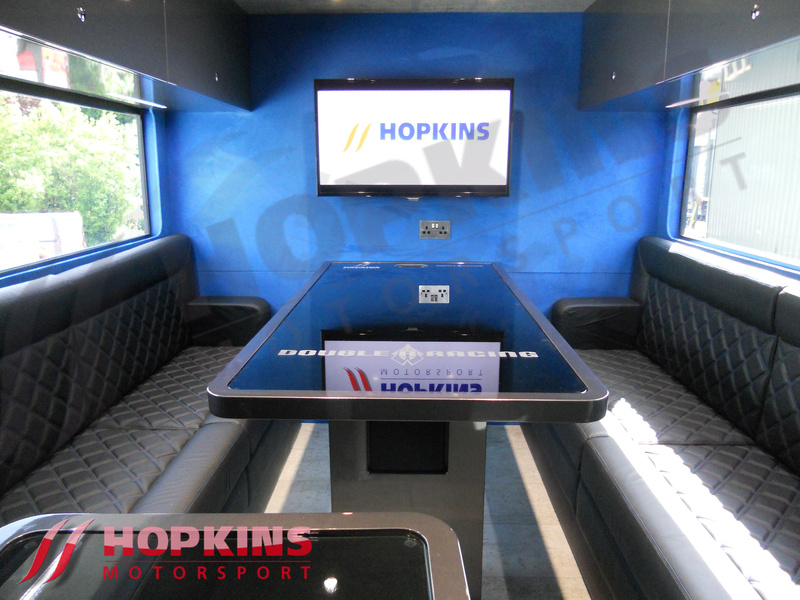 Below the goose neck (where the tractor unit backs under) roof panels finished in 3mm aluminium cricket weave. 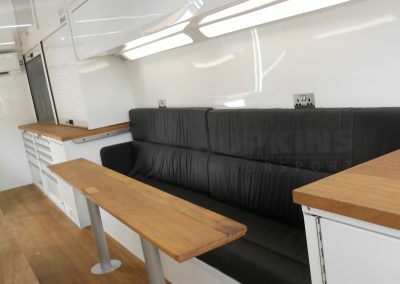 Generator compartment: The door and surrounding panels will be finished in 3mm aluminium painted to suit, the door will open on gas struts, the locker will be fully lined in 10mm lead insulation to reduce noise into the trailer and then fully lined in silver stucco aluminium, a bespoke fuel tank will be mounted outside the generator compartment but still behind the neck panels. 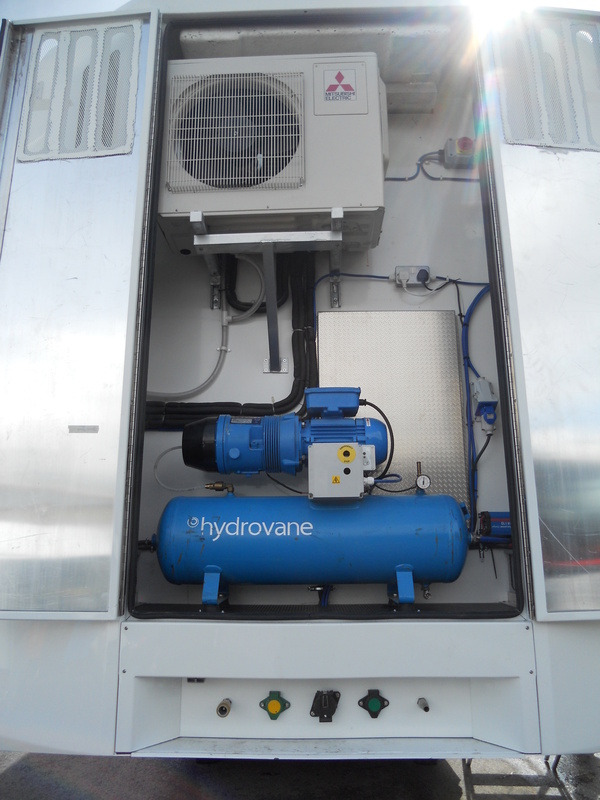 Services locker: Hinged side access locker on the right hand side of the generator compartment. 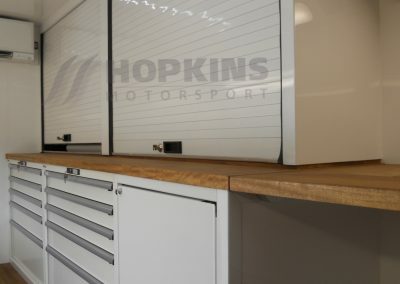 This locker will be finished in 3mm aluminium cricket weave, the locker will be for all main trailer services including: suspension raise & lower valves, hand brake, front landing leg or stability controls, roof raise and lower controls, two x 32 amp power outlets, two air line outlets. Wheel arch’s: 3mm aluminium construction hinging on the top edge fluted for air to suit. Rear End: 3x Led lights per side fitted to the side of the lift, all edges chamfered as per the bottom of the truck. 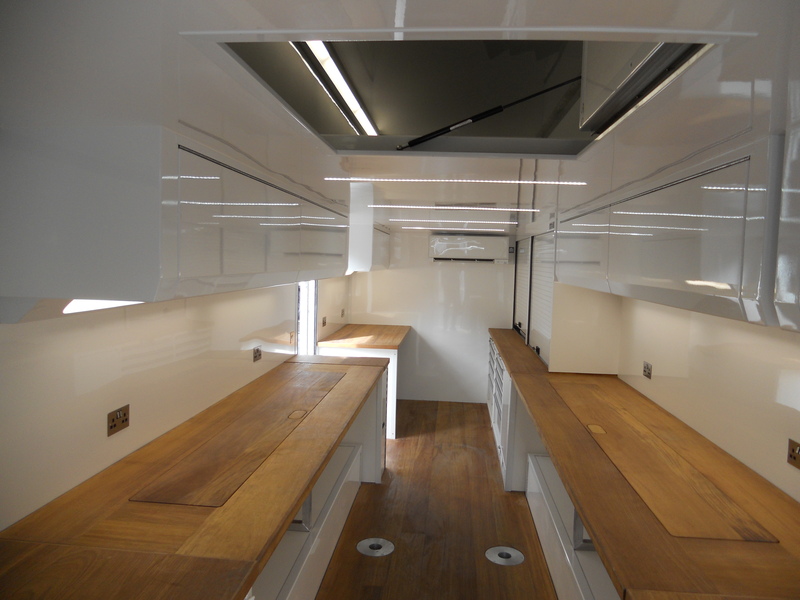 Roof: 32mm thick insulated panel, gloss white on both sides. Windows: 1x over fit tinted panel per side with black out to two internal windows. External power: 3 x power and air outlets at roof height. Power Outlet: A larger locker door will be fitted at the rear on one side for access to all Power input and output cables, also TV antenna and air, this locker will be fitted to all trailers even if not required. 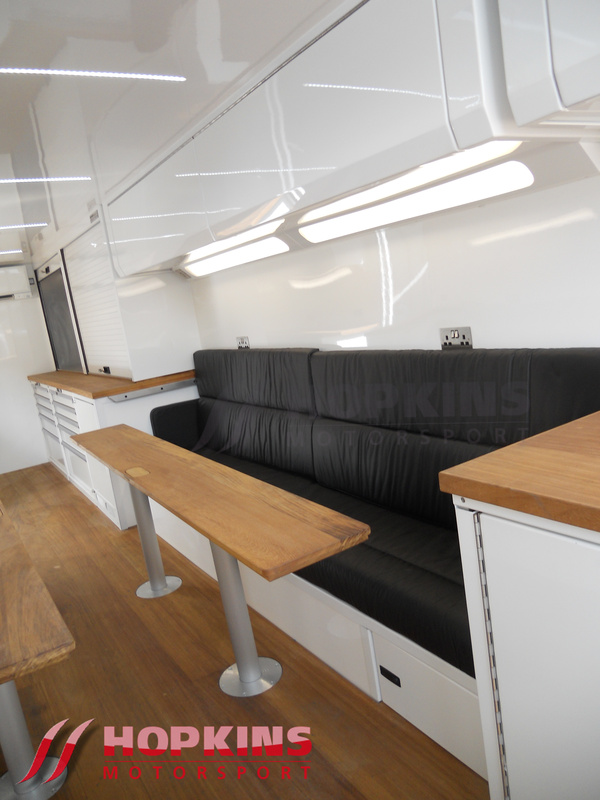 Seating: Bench seating finished in Black leather. Seat bases: Foam backed black leatherette. 2ndtable: Engineers table that is removable to increase the floor space. Overhead units: U shaped overhead units in high gloss black with recessed lighting set into the bases of the units all corners radiused. Base units: High gloss black base units on the bulkhead wall, 1 x corner wardrobe. Work tops: Black worktops & table top with power points to suit. Access: Side door with removable steps. Television: Mounted above units on bulkhead wall or above the table?. 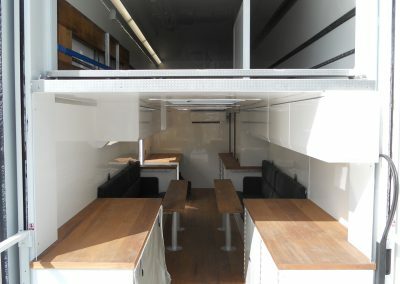 Seating on one sides for up to three people, removable table for engineers if required, overhead units for driver’s helmets, 1 x wardrobe, 1 fridge. The seating will also hinge to form 2 beds or fold over centre to allow this room to be used for bulk storage during transit. Ceiling: White with recessed lighting. 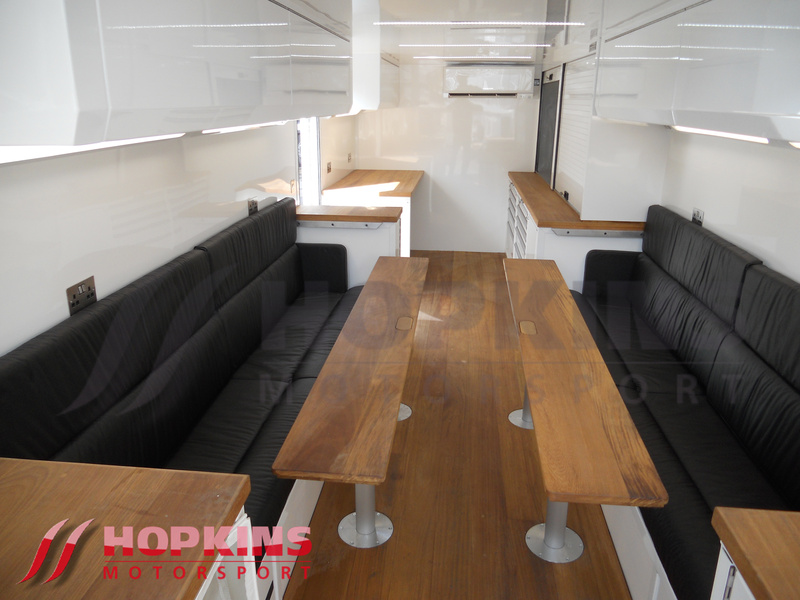 Seating: Bench seating finished in Black leather with storage below for drivers bags. Wardrobe: 1x 500mm wardrobes full height, 1 x 500mm above the fridge. Television: 32” LCD TV mounted centrally. 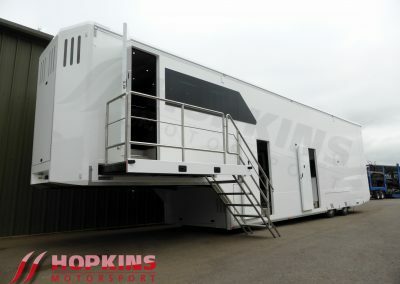 Overview: The workshop area is designed to carry two F3 cars with the front wings removed during transit. 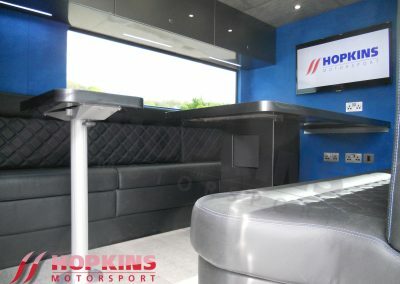 On arrival at the circuit the rear area will form a storage area and workshop, the middle section will convert into a debrief/engineers area that will seat up to eight people, the front section will store gear ratios & bulk components in Lista cabinets as well as seating for an additional engineer. Lighting: Full length corner lighting on both sides. Air: Air outlets at both ends. 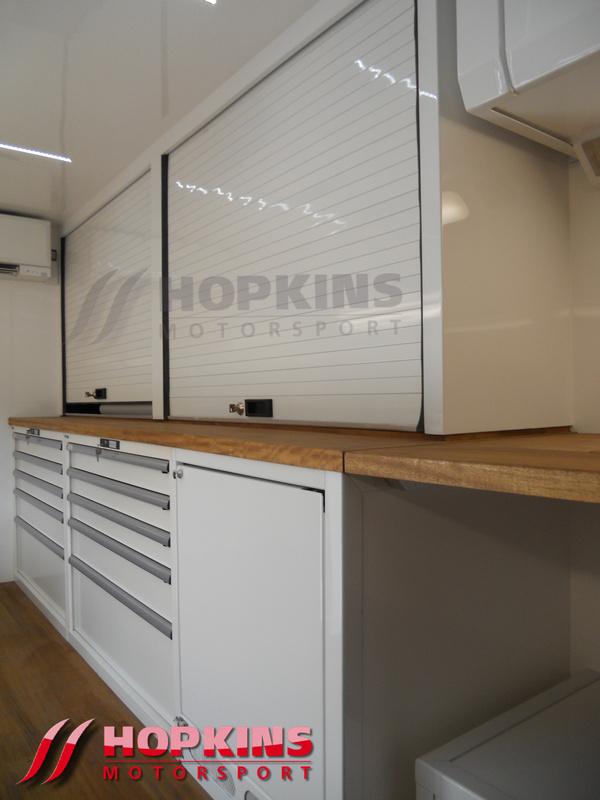 Fixed bench: length approx 2000mm with doors below for engine storage. 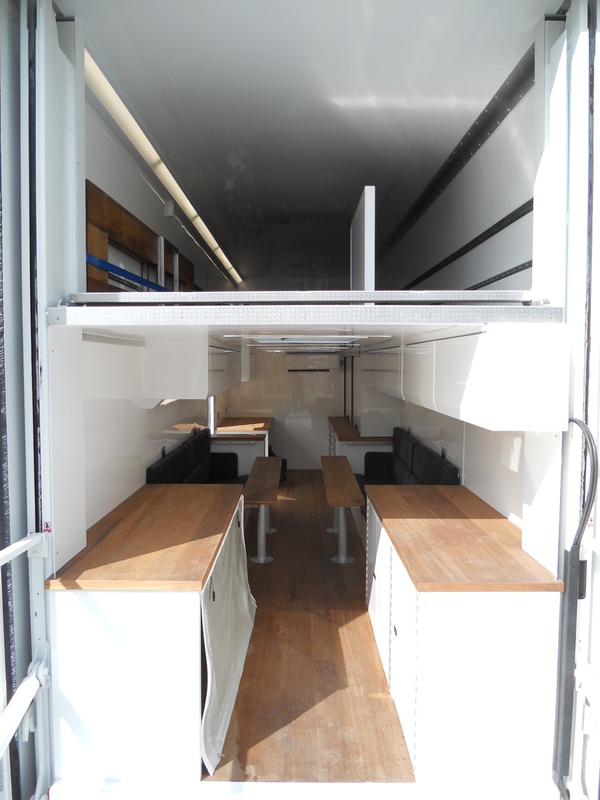 Front section: 2x Lista cabinets: Length 1023mm x 860mm high with 5 x draws of full extension. Fridge: 1 integrated 600mm fridge. Side personnel door: With removable infill. Floor tracking: 3x lengths of tracking recessed into to the floor.